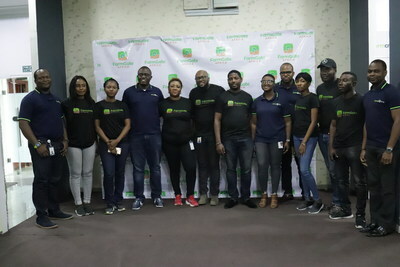 LAGOS, Nigeria, April 4, 2019 /PRNewswire/ — Farmcrowdy Group (FCG), has today launched a new subsidiary, Farmgate Africa, a technology-driven agro-trading market place for agriculture commodities in Africa. Led by Kenneth Obiajulu, Co-Founder & Managing Director, Farmgate Africa (FGA) is bridging the gap between rural farmers and processors. Buyers have the opportunity to purchase commodities directly from farming clusters through technology. The Farmgate Africa platform serves to build relationships between local farmers and major processors, aggregating commodities while paying attention to the unique specifications of the buyers. The system allows everyday Nigerians fund the process of buying and selling what farmers have already harvested. This will give every farmer that has produced high quality farm produce, the opportunity to sell to major buyers through Farmgate Africa’s portal. For additional information on Farmgate Africa or interview requests with Managing Director and Co-Founder, Kenneth Obiajulu, contact press@farmgate.africa. Farmgate Africa is a technology-driven solution bridging the gap between farmers and market processors. Leaning on the wealth of experience and operational expertise provided by the Farmcrowdy Group, Farmgate Africa, will over the next two years, focus on deploying funds across various market points. This will focus on beef processing and developing aggregation capacities across maize, soybean, sorghum and dried-split ginger for markets across Nigeria, UAE and UK.